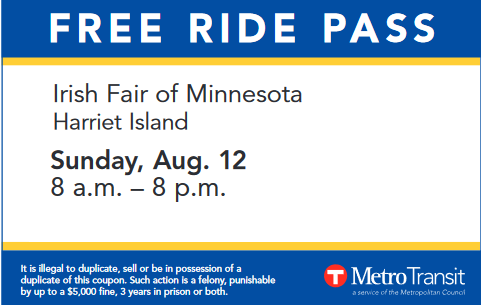 Not only is the Fair free, thanks to our partnerships with Metro Transit and Union Depot you can get to the Fair for free! 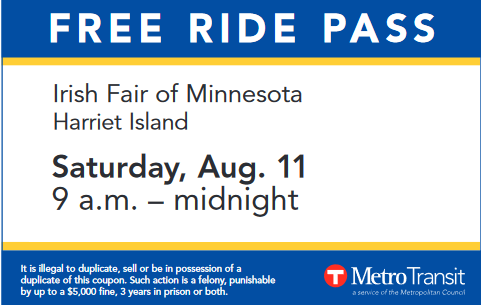 Attendees can take the Metro Transit Green Line or a bus to Union Depot and take the free Irish Fair shuttle. The shuttle will pick up Fair attendees at Union Depot on Kellogg Blvd between Wacouta Street and Wall Street. Click on the pass below to print. Retain this pass for your return trip. One pass may be used for all members of your group. 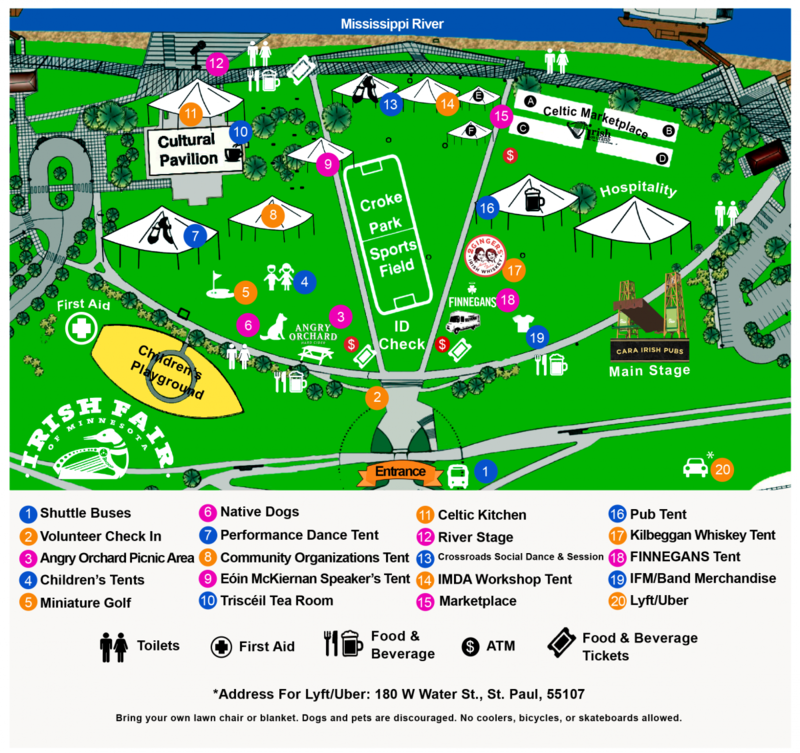 Please catch the complimentary Irish Fair shuttle at Union Depot on Kellogg between Wacouta Street and Wall Street. Watch for the Irish Fair shuttle signs at Union Depot. Park at Union Depot and you can catch the shuttle to the Fair! Shuttles will run every 30 minutes (on the hour and half hour) from Union Depot and Harriet Island's main entrance. *You can ride the Irish Fair Shuttle if you park in other ramps, locations, take the bus or light rail. Normal pricing if arrival is outside of the above hours. Want to learn more about Union Depot Parking? 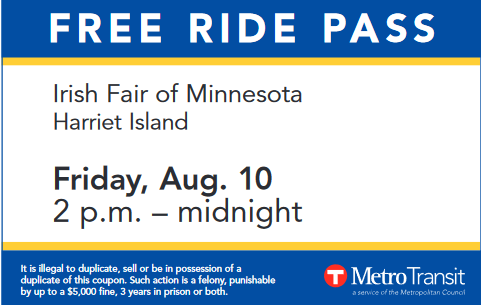 Thinking about taking a taxi or an Uber to or Lyft from the fair? Please use this address, 108 W Water Street. Lyft code: IRISHFAIR18 | Good for existing and new users, $3 off 2 rides, to or from the event. Available from 2pm on Friday 8/10 to Sunday 8/12 at 11:59pm.